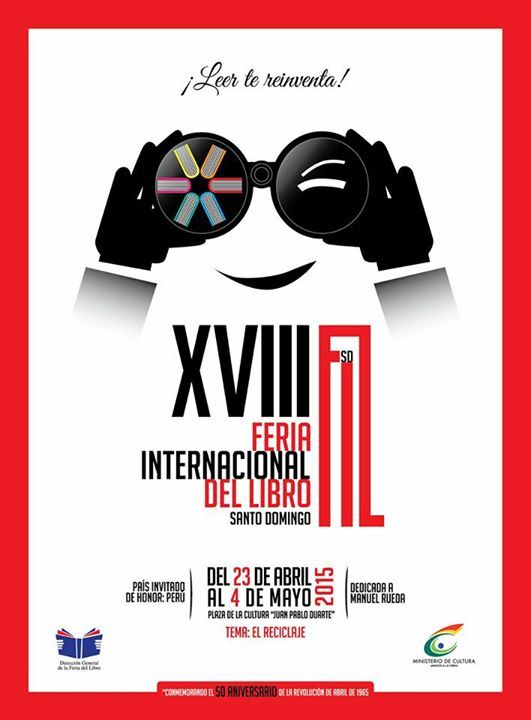 XVIII Feria Internacional del Libro Santo Domingo 2015 / The 18th International Book Fair of Santo Domingo 2014 (FILRD2015). This year the fair is dedicated to the writer Manuel Rueda (Manuel Antonio Rueda González – Born August 27,1921 – Died December 20, 1999). The Pianist, poet, Play write was born in Montecristi, República Dominicana. Some of his more famous books include “La trinitaria blanca” and “Vacaciones en el cielo”. This year special honored guest country is Peru. There will be more than 220 booths for libraries and entities linked books so they can participate in this years event that is considered one of the most important in Latin America. The cultural program has book presentations, conferences, lectures, workshops on cultural aspects, discussions, panels, entertainment, activities, visual arts, theater and any other events all related to the world of books and reading. This year there will be a few very special new things added to the fair. A Pabellón de la Comunicación / Pavilion of Communication and Bulevar de la Canción Dominicana / Boulevard of the Dominican Song presenting the history of Dominican music. There is also a section dedicated to young Dominican Poets from different parts of the country. They will also be commemorating the 50th anniversary of the Revolución de abril del 1965 / Revolution of April 1965 with a series of debates, forums and conferences. One issue that will have great impact in the fair this year is the recycling program, processing waste materials which otherwise would simply be ignored. This initiative has led to the use of creative material from previous fairs to create some unique art works. The delegations participating include Puerto Rico, Costa Rica, Panamá, Perú, Spain, Argentina, Mexico and more. Get a complete list of books and writings by Manuel Rueda from Amazon. Events 2015, annual Book Fair, art, book, event, fair, Feria Internacional del Libro, International Book Fair, Manuel Rueda, plaza de la cultura, santo domingo. permalink.